Now, this is a daring topic. When I visit quilt guilds around the country, the general understanding is that politics and religion are off the table. I have found that traditional quilters, who make up the majority of quilt guilds, tend to be politically conservative. Similarly, they strive to follow the rules of quilting, seeking well balanced, well-executed, beautiful patterns and palettes. 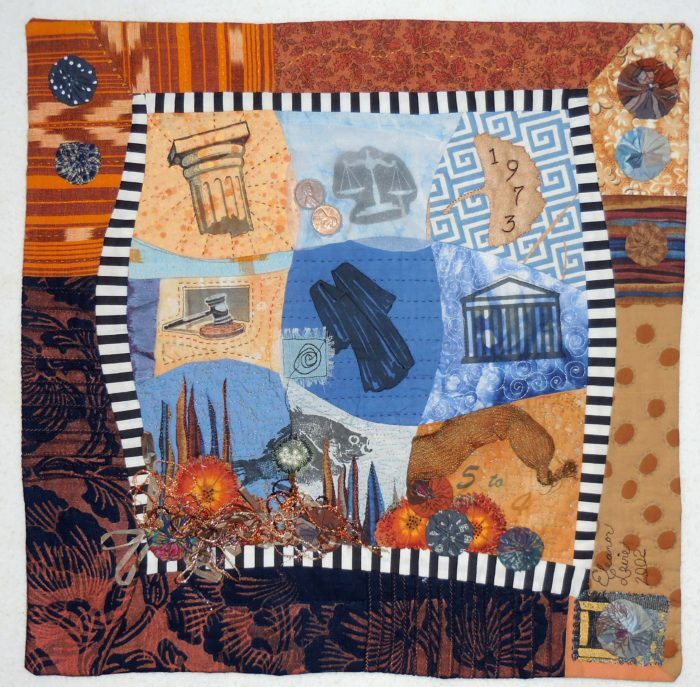 Art quilters, on the other hand, are expected to embed their compositions with deeply held concepts and ideas—often progressive and sometimes provocative, and to choose techniques and materials that are in keeping with the ideas expressed. I was lucky enough to be juried into this exhibit at the RMQM, with a small quilt–only about 14″ square, that I made many years ago. It’s that most traditional of quilt blocks: the Nine Patch, but I threw in some curves, some imagery, and some unusual materials–including two pennies minted in 1973, to represent my two cents’ worth. My little art quilt was made 14 years ago, but the struggle for reproductive choice, as decided by the Supreme Court in 1973, has never abated. Roe v. Wade hangs on by a thread. It seems to me to be the number one defining issue of this election, both for the presidency and for the Senate that advises and consents on the president’s judiciary nominations. In any case (except a Court case), this “patchwork pundit” is proud to have my politics hanging on the walls of the RMQM. This entry was posted on Saturday, November 5th, 2016 at 3:04 am	and is filed under Art + Quilt, Exhibitions, Personally Speaking. You can follow any responses to this entry through the RSS 2.0 feed. You can leave a response, or trackback from your own site. You forgot to include tears and money signs in your nine patch. Oh, as that watery environment shows, there are always tears and a human cost in the very difficult decision that must remain a woman’s to make, with the help of her doctor, family, and possibly spiritual guide. I love the quilt and what it represents. As always, you have a great twist on words, such as the roe in the fish. Your work are like small environments – you can explore and find all kinds of treasures. Congratulations. Wonderful quilt, makes a point as well as being lovely and fascinating. Thanks. A hard, important subject, part and parcel of religious freedom and human rights.